Reward yourself and your baby! Join EQ Baby Club today! Exciting months ahead await the EQ Baby Club Members! Beginning June 2015, EQ Baby Club members can get exclusive perks and privileges from partner merchants! Indeed, motherhood was never this fun and rewarding. As part of its commitment to make motherhood a joyful and memorable experience, EQ Baby Club has partnered with selected merchants so that Moms can enjoy herself and her time with loved ones even more. Fashion, lifestyle, food and leisure brands will be giving out discounts and freebies to EQ Baby club members who will show their EQ Baby Club IDs in partner establishments. Enjoy wonderful perks and privileges guaranteed to make motherhood (and bonding time with loved ones) a most memorable experience. Excited about this new offering? Become a member now by availing any of the three EQ Diaper Variants (EQ Dry, EQ Colors and EQ Plus) and register online and on-site via selected EQ baby Care registration booths. 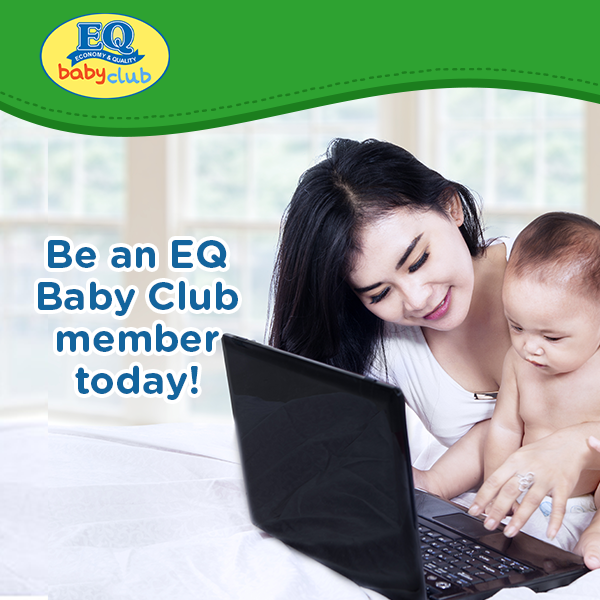 Activate your membership online and get your EQ Baby Care card to start enjoying the various rewards that await! With EQ, you can enjoy the best value for money diapers at an affordable price…and indulge in the wonderful perks and privileges that go with it. Please check out posters and flyers for more details. Like the EQ Baby Diapers Facebook page for regular updates.